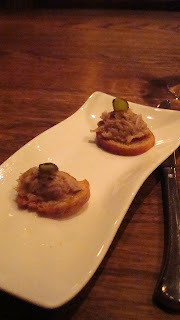 and an amuse of duck rillets, which were very tasty and not too oily. We both opted for the duck confit and I kind of wish I had stuck to my rule, that we have to order different things, and gone with my first choice the halibut. It was not that the confit was not any good, as it was-moist, but not oily, however, I did think the skin could have been crispier. 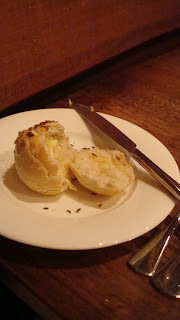 My main problem was that confit in and of itself is quite rich and when served with the very good and buttery pomme puree and a very hearty puy lentil and bacon creation, it was altogether too heavy a dish. My ideal duck confit can be found at Onde in Sydney where it is paired with caramalised apple, walnuts, mesclun salad and a side of frites. 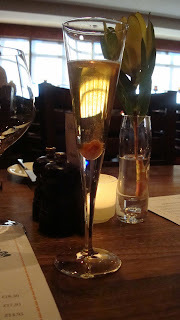 Anyway, one of the highlights of the evening was when the very gracious Mrs Clarke who does FOH came to offer us a free glass of fizz and glass of white on the house to celebrate our night of freedom. It must be the only time in the history of forever that both of us declined- oh how times have changed! My alcohol tolerance being zilch now, a second glass would have been messy.